What Are The Effects Of Singers Tea? Ask any vocalist what one of the keys to staying fresh vocally is and undoubtedly hydration will be on the short list. While each has their own opinion as to what might work best IN said liquid, generally water remains one of the key ingredients. As for the guy in the corner with the jug of petrol well there are of course exceptions to every rule. Now today's subject is a liquid typically served warm. This beverage has been around since the 10th Century BC. From its humble origins in early Tang Dynasty China later gaining popularity and finally fanning out to Western civilization around the 19th century, tea was, and still is, one of the most widely consumed drinks in the world. While there is no direct proven relationship between the consumption of tea and positive health effects, tea leaves contain somewhere around 700 different compounds, some of which are in fact related to positive health effects including flavanoids, amino acids and vitamins. It then seems reasonable to say that drinking tea in moderation certainly isn't damaging to your health and may even be a good thing. Singer's Tea: What Is It? With that in mind on the chopping block are a duo of herbal tea's from Vishudda Singers Tea. Vishudda loose-leaf teas feature a proprietary blend of ingredients geared towards singers which aim to sooth and coat the vocal chords. 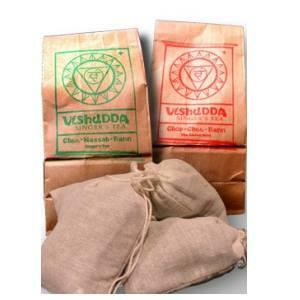 One thing to keep in mind with the Vishudda teas is they are loose leaf teas so you will need to equip yourself with some kind of infuser which can be purchased at most kitchen or tea stores. It's also important to note that to avoid bitterness each type of tea has a specific steep time that will result in the most flavor and least amount of bitterness. Vishudda teas do not come with directions on the package but since they are green teas they are generally best when steeped for approximely 1-2 minutes with water that is slightly cooler than boiling (175 F ). Of the Vishudda lineup I had the pleasure to sample both the Chop-Chee-Rann and Chee-Nassah-Rann teas. Starting with 2 minutes steep on the Chop-Chee-Rann mint tea. I was fairly impressed with the overall taste and smoothness. The Chop-Chee is quite a nice double mint tea with wild peppermint, eucalyptus and essential mint oils that did in fact have a subtle soothing effect in my throat that seemed to last. In a rehearsal setting I felt the net effect of the tea over plain water did seem to contribute to my vocal chords feeling a bit more lubricated over the course of the session. The Chee-Nassah-Rann tea on the other hand had just a bit more bite to it but overall was just as pleasant. I can only attribute this mainly to the ginseng and gota kola not present in the Chop-Chee-Rann tea. Again I felt a nice minty soothing coat against my throat which in addition seemed to ease a bit of mild congestion I was experiencing. Vishudd as Vocal Inhaler releases a vapor that is used to open the resonators for Singing.